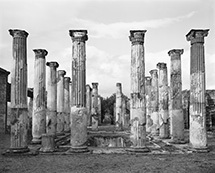 Pompeii Archive: Photographs by William Wylie | The Fralin Museum of Art, U.Va. Pompeii Archive features a selection of work by American photographer William Wylie exploring the archeological site of Pompeii in highly evocative images. Wylie’s interest in the contemporary state of Pompeii began with his discovery of the work of Giorgio Sommer (1834–1914), a German photographer who documented the excavation of the site in the mid-nineteenth century. An avid historian and collector, Wylie began collecting Sommer’s images and researching his work, particularly Sommer’s strategic use of photography to flatten the picture plane and create layered and stratified images that evoked the archeological processes. Examples of Sommer’s work are also included in the exhibition. This ongoing research, and the body of work that has resulted, was supported by Yale University’s Doran Artist in Residency awards at the Sol and Carol LeWitt estate in Praiano, Italy, where Wylie was a resident in 2012 and 2015.